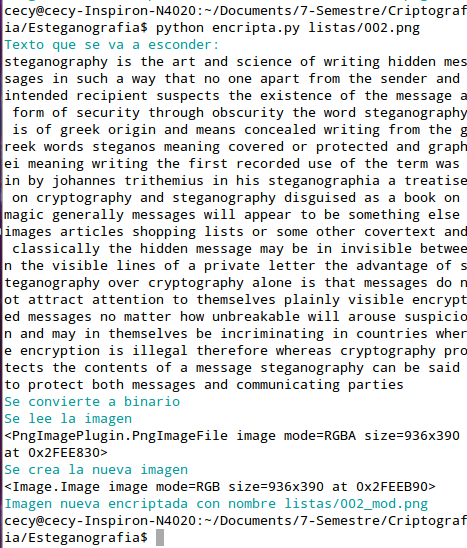 The images that I hide a message are the 001.png, 003.png and 005.png. I used big images because it can make more difficult to spot the changes. I used the LSB algorithm to encrypt the message. Before, I created a list with the phrase in binary. Then I put this bits in the LSB but I started to put the bits in the image from the middle of the image and I used a space for each word of 10 bits. This is a little more complicated. I created an algorithm for look all LSB and then I search for differents sizes than can be the block of word. Once I find this, I start to check all the image and I get many data that can be the phrase that I want, but this doesn't make sense. Now I used a library that can help me to know if a word exist or not and automatically I get a phrase coherent. Llevo media hora instalando cosas para poder correr tu código y me aburrí ya cuando salió esto: "enchant.errors.DictNotFoundError: Dictionary for language 'en_US' could not be found". 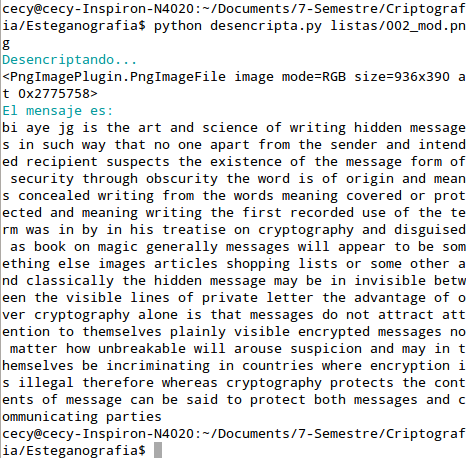 Lo que había que ocultar era tu mismo python y hubiera sido mejor incorporarlo todo en un sólo programa. Van 8 pts, ya incluyendo los hackeos parciales que lograste.